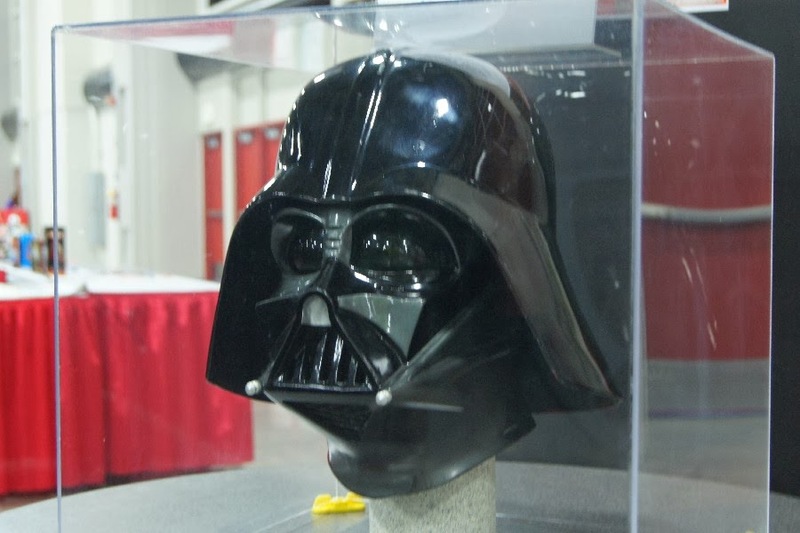 This helmet was at our local con last year and it was said to be screen used ESB currently owned by a collector named Amy White. I did quick search and found several references to Amy White owning a mostly complete ESB screen used costume. Can someone comment on the validity of this and perhaps point out where in the movie this particular helmet was used if that's known. Thanks! Last edited by mikkonator on Wed Jun 18, 2014 5:05 pm, edited 1 time in total. Hmm didn't even think about that, after this con I ramped up my Vader involvement so I didn't think to take any better pics than the first, I found a few other ones on our 501st garrison page, this being the best I think that shows the thumb indent. And I guess it's spelled Amy, not Amie, lemme see if I can correct my mistake. Are these all the pictures you have of it? since a lot of the original ESBs saw some modification to ROTJ. is very difficult. But it does have elements that I have only seen on production helmets. Let's see if I can get these bigger, again, this guy is not me and these pics were not taken by me, only the original with my cell phone. These were really the only usable ones, there were few others but looked the helmet was moved each day for the con and the dome position got worse each day! The face plates authentic imo no doubt thanks to the close ups. The dome however is strictly ROTJ as pointed out. NICE huge pics shots and thanx for introducing this piece . Holy Crap Batman! that will do, big time. Thanks. It definitely does look authentic. Very compelling. But I reserve my judgment at this point. Let me check it out and I'll get back do you. I've had a chance to study this helmet and I must say that it is a nice helmet. IMO it is not a fan made helmet. However, I don't believe it be a screen used helmet either. If it were, it would be an ESB action prop, not a hero prop. 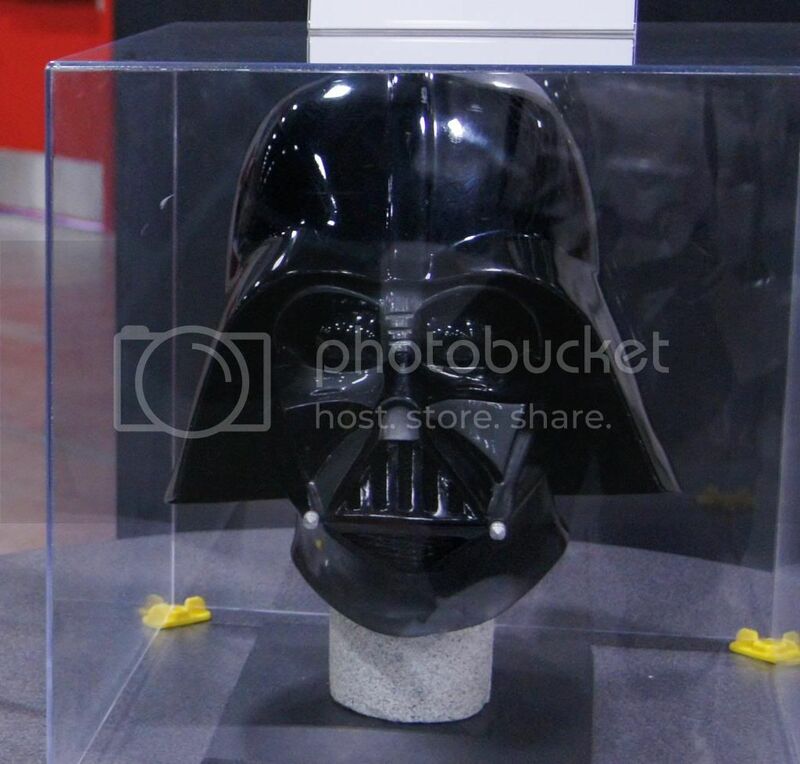 ESB did have action level Darth Vader helmets, however, this helmet falls somewhat south of the line even compared to them. had direct access to an actual screen used helmet(s) and/or the paint that is used to paint them, as the colors and how the helmet is painted is consistent with the production ESB. Having said that, I still have some concerns with this helmet. cheek pretty well. Also, the terminator line between the gray and black above the nose is a bit high up on the side of the nose compared to actual screen used helmets. I am somewhat curious about the damage on top of the nose. It appears as if someone deliberately sat there hitting it again and again with something hard that has an edge to it, all the way down the nose. When I got to the bottom, they started going around its edge. An angry little sister perhaps? One major concern is the lack of the lip on the dome. The dome edges are simply the width of the fiberglass and the edges smoothed off. Compare this to the ESB stunt lip which is inserted. consistent with the ESB action helmet, except that the grille mesh appears to be an angled expanded metal, whereas ESBs used a flat diamond grille. Lastly, I have issues with the quality of the casting, specifically the mouth, the chin, the tubes and the base of the neck. The mouth and the bridge between the tusks is fairly deformed and snakes in and out. right of center. This does not appear to be a dent, but an issue with the cast itself. I do not believe that production would've allowed any of these issues to make it to a possible screen used helmet. So in my opinion this was most likely a tour helmet. Made for ESB, but then modified somewhat for duty as an ROTJ. It's got that real deal look, but I know it isn't. I hope she didn't pay $15,000 for it. The helmet definitely doesn't look like something that was made recently, it's got a good patina to it. And despite all its flaws it still looks really good sitting on that table. Honestly it looks at a glance like the "No, I am your father" helmet. And it looks clean enough to me to be a hero helmet having seen a couple in person - I'm talking about the paint, finish, etc. Thoughts on the "father" helmet? Look at neck, widows peak, etc. The Dome is ROTJ and so are the tusks. 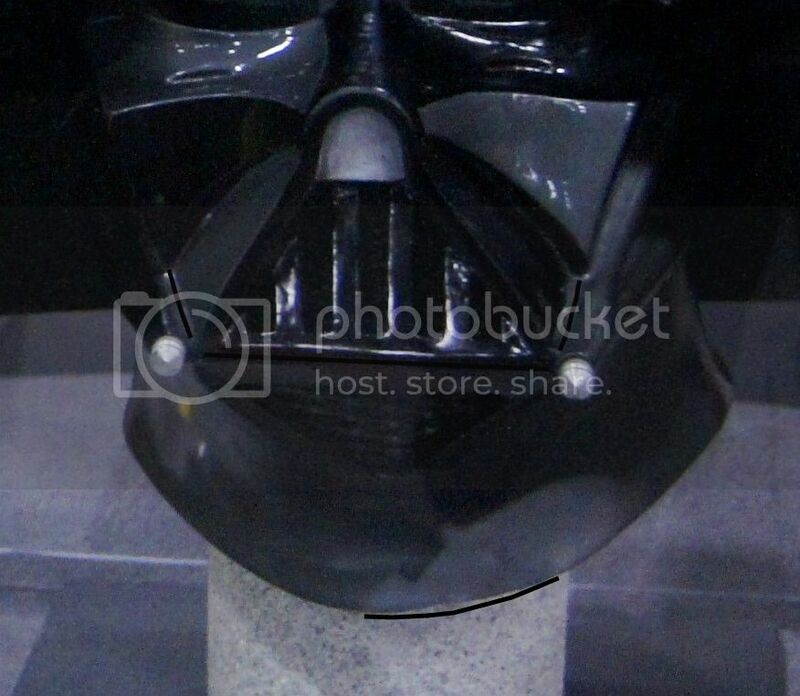 It looks like the helmet in the Death Star throne room scenes, even the gunmetal looks to be right on. But I could be wrong. It looks authentic, yet still slightly short of looking like a complete screen helmet. I say it's a ROTJ your helmet. Last edited by jedijeffrey on Thu Dec 31, 2015 3:25 am, edited 2 times in total. The lighting was bad as they had just shut down the convention. There are a couple of other things not seen in the pics that are markers of it's authenticity. Last edited by jedijeffrey on Thu Dec 31, 2015 3:26 am, edited 1 time in total. 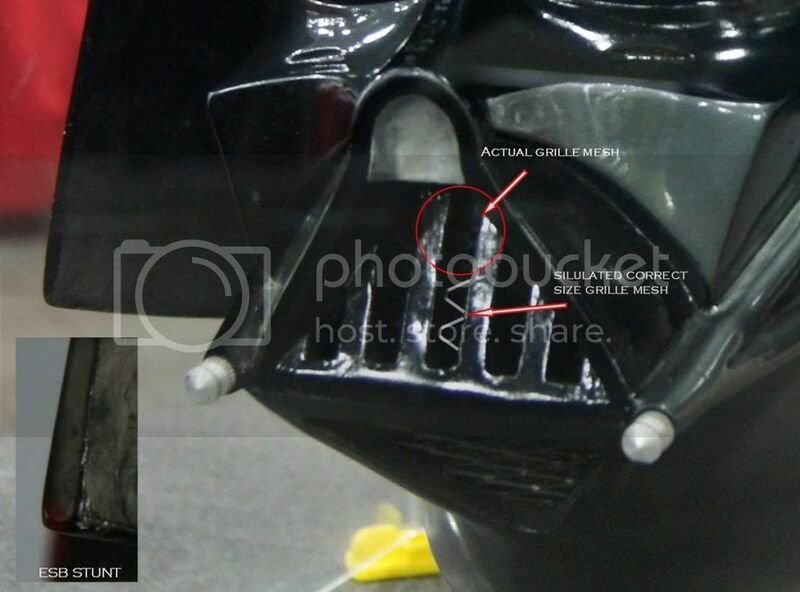 Quite frankly after a second look, I believe thats the best genuine real deal ROTJ helmet I ever seen. Both pieces are exquisitely true to onscreen especially the dome and no disrespect to White's claim of it being an ESB.... The GH is nice but unfortunately warped and the JRX although one of the best via TM, seems to miss slightly as a conversion. This imo is the top of the heap ROTJ and would luv to have a cast if future offers were considered !